NextThe Peacock, in all its splendour and glory. The Coronation of Napoleon I, Emperor of the French. Who would have thought a relatively obscure Corsican by the name of Napoleon Bounaparte, would rise to prominence during the French Revolution to become Emperor of the French, and for a short while, master of Europe. He was brought up on his mother’s stories to hate France, the oppressor of his homeland of Corsica. (The Corsicans had long desired to become an independent nation. This came to a crashing halt when the King of France, Louis XV brought Corsica from Genoa in 1768, a year before Napeoleon was born in 1769.) But in time, he would hate France a little less and convert to the French cause. “I sacrificed my native land. I abandoned my possessions. I lost everything for the Republic….” – Napoleon Bonaparte. Napoleon owed everything to the Revolution, which made him at the age of twenty–four a brigadier general. (His brilliance and remarkable aptitude for leadership and decision making was noticed and nurtured by Viscount Paul de Barras, whom made Napoleon general. Barra is often known as the man behind Bonaparte’s early success.) In these formative years, he was witness to some of the most important events of the Revolution: the demonstration of 20 June 1792, in which the French people humiliated the King and more importantly the chaos that resulted from of an angry mob who stormed the Tileries. It was a sad day that saw the massacre of the Swiss Guards and the abolishment of the Monarchy. Storming of the Tuilerris Palace, 10th August, 1792. Painted by Jean Duplessis Bertaux. Napoleon took note of these events and which in turn made a lasting impression on his career as an officer. The storming of the Tuileries, in particular, taught him a valuable lesson on how to deal with and quell a riot: with cannon fire! Napoleon was also scathing of the Louis XVI, condemning his weakness to act more quickly during the riot. Napoleon went on to commented in a throw away line, that if he was king, it would not have happened that way. 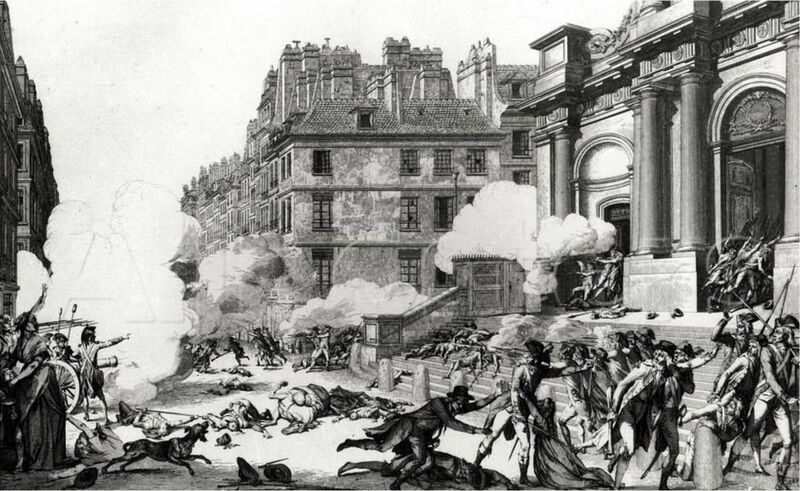 Sure enough, three years later in 1795, Napoleon’s cannons saved the Convention with the timely ‘whiff of grapeshot’ at the steps of the Saint-Roch church. The terrifying effectiveness of Napoleon’s 40 cannons earned him the nickname of “General Vendemiaire”., a title which Napoleon referred to as his first title of glory. 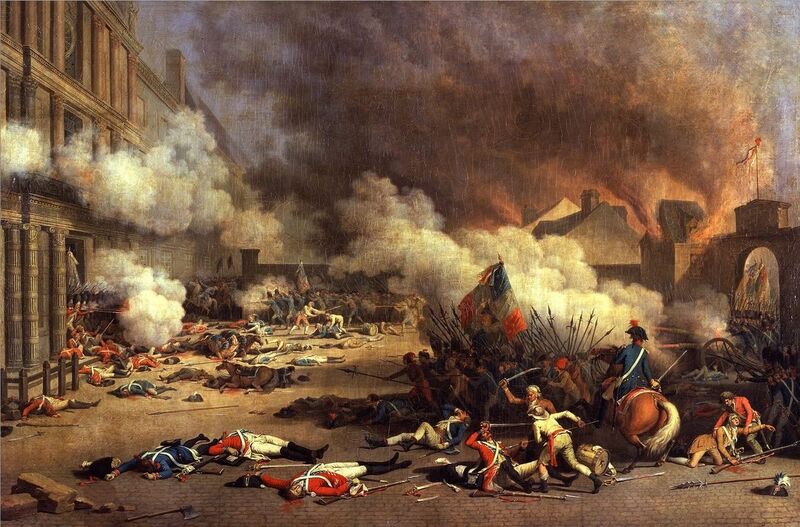 The royalist under attack from Napoleon’s cannons at Saint-Roch church on 13 Vendemiaire, October 5th 1795. It seemed that from here on end, Napoleon could do no wrong. In 1796 he was rewarded with the command of the shabby Army of Italy. This poorly equipped and raggedly dressed army would be whipped into shape by the military genius of Bonaparte. The well-led Army of Italy would go onto humble the disunited leaders of Italy. In the second half of 1797, Napoleon decided to leave Italy for Paris. He had grown in power, even the Directory (the revolutionary government) was weary and unable to cope with his popularity. It was arguably on his journey back to Paris that he began to fancy his future as a supreme leader. It was when the Directory began to falter while he was away in Egypt on expedition in the year 1799 that Napoleon struck. He rushed back to Paris and orchestrated the coup d’etat of 18 Brumaire. The result all but made him the dictator of France and he immediately began to consolidate his power. He quickly set up the foundations of his consulship, controlling the press and whatever else he could get his hands on! Under his consulship the new constitution was enacted, he also establish the bank of France in May 1800 (which had the monopoly of creating money) and he helped put together the Civil Code, which was eventually enacted early in 1804. 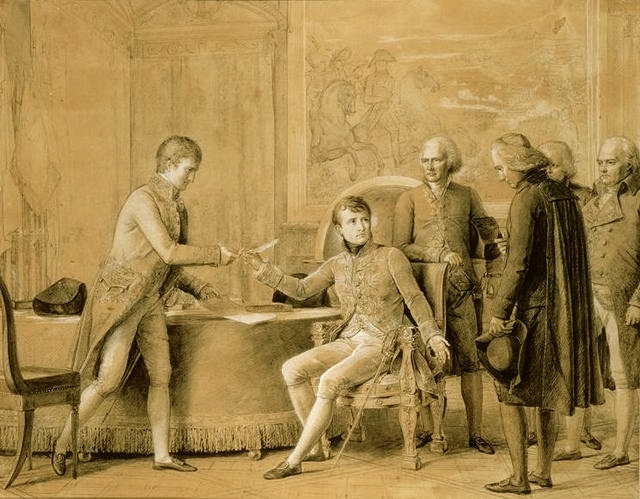 Napoleon signing the Concordat on July 16, 1801. It was an agreement that brought reconciliation between France and the Roman Catholic Church after end of the Revolution. From then on, through the power of his consulship he continued to reform the administration, stabilize the country, reconcile with the Pope and impose peace on many of France’s enemies on his own terms. Official propaganda manipulated by Napoleon himself, would later result in a call for Napoleon to be made Consul for life. A plebiscite or referendum on the question was drawn up and an exhilarating result in favour of Napoleon becoming consul for life was celebrated. With this success Napoleon set in motion his plans for a coronation. He immediately started to behave like a crowned Emperor (even before the actual ceremony) by setting up his own court and even its costumes. He also went to the extent of reintroducing customs and formalities that had not been used since the days of Charlemagne. With the support of the French public reassured, Napoleon sort the Pope’s blessing to endow him with spiritual legitimacy. Trying to convince Pope Pius VII was always going to be a delicate matter. After a great deal of hesitation, the Pope was eventually convinced to perform the cermony. 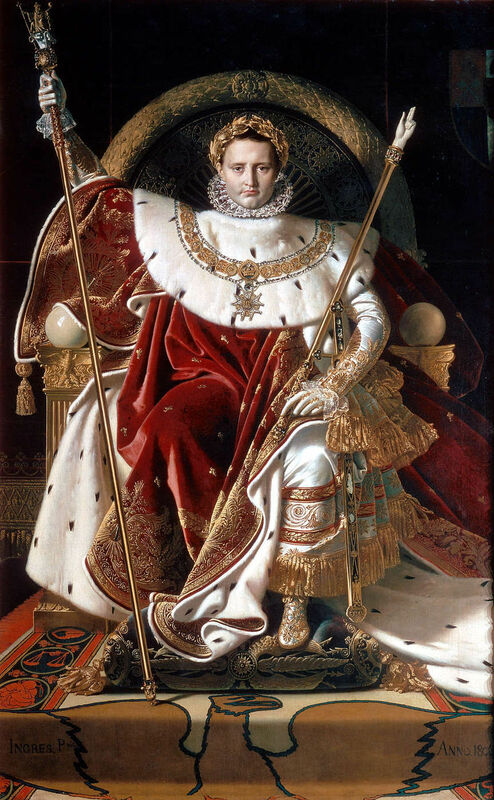 Napoleon on his Imperial throne dressed in all his vestments by Jean Auguste Dominique Ingres, 1806. Frank McLynn, Napoleon: A Biography, Arcade Publishing, 2011. Andrew Roberts, Napoleon: A Life, Viking Press, 2014. Andrew Roberts, Napoleon The Great, Penguin Books, 2015. Alan Schom, Napoleon Bonaparte: A Life, Harper Perennial, 1998. Kate Williams, Josephine: Desire, Ambition, Napoleon; Hutchinson, 2013. The header image is the coronation of the Emperor Napoleon I and the Empress Josephine by Jacques-Louis David, 1808. The Peacock, in all its splendour and glory.